The VLX™ Vagabond™ Lithium Extreme is the fourth-generation of the Vagabond™ portable power line, offering a reliable, convenient, and lightweight portable power source. 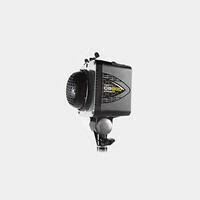 When working in the field, the VLX™ provides a current-controlled, pure sine wave power source for operation of AC powered studio flash units in locations where AC power is either unavailable or unreliable. The VLX™ system arrives with a high capacity lithium iron phosphate (LiFePO4) battery connected to our VLX™ inverter, taking the power from the battery and converting it into a usable, 120VAC pure sine wave power source. Your flash units are connected to the inverter, plugging into the standard, 3-prong grounded power outlets on the inverter (to power more than two units, a grounded power strip may be used). 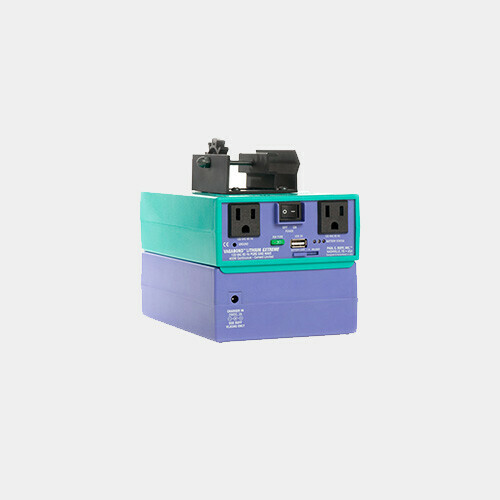 The system is capable of powering multiple flash units in various power model combinations, powering units with a combined total wattsecond rating of up to 3,200 wattseconds. A single VLX™ can operate an entire 4-5 light system (using "Power Bar" extension cords) in the field at usable recycle times, or multiple VLX™ units can be employed for lightning fast shooting and extreme numbers of shots per charge. VLX™ typically cycles 640 Ws in 2 seconds, 1280 Ws in 4 seconds, 1920 Ws in 6 seconds, 2560 Ws in 8 seconds, and 3200 Ws in 10 seconds, as well as most 1200 to 2400 Ws power pack systems in 4 to 8 seconds. It employs a very sturdy metal light stand clamp for up to 1-1/2" poles, and a 2A USB port capable of charging smart phones and tablets. Typical shots per charge is 1000 full power 320WS pops, 500 pops at 640WS, 250 pops at 1280 seconds - proportional to total WS recycled. Note: Like essentially all battery/inverter type supplies, constant lights or modeling lamps should not be used because their power draw would quickly deplete the battery. The modeling lamps should be turned OFF, only used for brief previews to maximize battery life, or replaced with very low wattage lamps for successful operation.